As a medical sales professional, you likely have concerns about being fired from your current accounts. As they say in most places I’ve been, that would be a bad thing! But what if the shoe were on the other foot…what if you had customers you wish you could get rid of? Is it ever appropriate to give existing (and maybe even lucrative) customers the boot? That’s what I discuss in this episode of the Medical Sales Guru Podcast. You can listen by clicking the player below or searching for Medical Sales Guru on iTunes. Learn about Medical Sales Academy, the online training and support site for medical sales professionals that teaches tested skills that work. Or click the button below to be notified when Medical Sales Academy enrollment reopens. Should You Focus on The Cash in Medical Sales? Yes…and No. Let’s be honest…you probably didn’t get into medical sales only to make the world a better place. Yes, I know – you have altruistic motives, but high-income potential is what often draws people into the industry. As a medical sales representative, should you focus on cash? Yes. And no. I explain in this podcast. I also provide a quick way to prioritize customers in your territory. Listen to The Medical Sales Guru Podcast with Mace Horoff by clicking on the player below or by searching for Medical Sales Guru on iTunes. If you’re in medical sales, getting good at sales calls isn’t enough. You must master follow-up to sell consistently. Most reps are clueless when it comes to this. But…you need not be one of them. You can listen and learn. How cool is that? Get ready to look at following-up with customers like never before! Medical sales representatives often feel like they have no power in the healthcare sales environment. It’s not true. You already have power, and if you don’t, you can create it. Either way, it must be applied carefully. This is important stuff! Listen to this episode and learn what I’m talking about…it could make a big difference in your sales outcomes. But there is some good news, that is, you have options when you find yourself stuck. If you’re not hitting the sales numbers you need to hit, or want to hit, this episode of The Medical Sales Guru Podcast offers some sage advice. Listen. Take action. Move forward. Learn about Medical Sales Academy and how it can accelerate your medical sales success (so your competitors hate you for stealing business from them…ouch!) . It sounds good, but so many sales reps…as well as their prospects and customers…only consider the cost of action, while neglecting the cost of inaction. In this podcast, Mace Horoff presents some case examples from his days in the territory. You’ll learn how he lost some big sales opportunities so you can avoid doing the same. You’ll also learn how he turned it around. The cost of inaction is an important thing to know in your medical sales career! Share the podcast with the sales colleagues in your organization. And please…leave a comment below. Thanks! As a medical sales representative, you work hard to develop relationships and build your reputation. It can take years to achieve this. Yet, too often, you’ll see medical sales reps exhibiting behaviors that serve to detract from and diminish how they want to be known. Think you’re immune? Why take chances? Listen to this episode of The Medical Sales Guru Podcast and make sure you’re protecting your relationship and repetitional capital. Want expert training and insight in your territory all year long? 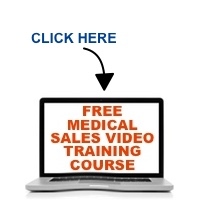 Check out Medical Sales Academy On-demand training and support for medical sales professionals.